The Divisional Court today gave judgment in the landmark case of Grecu & Bagarea  EWHC 1427 (Admin). 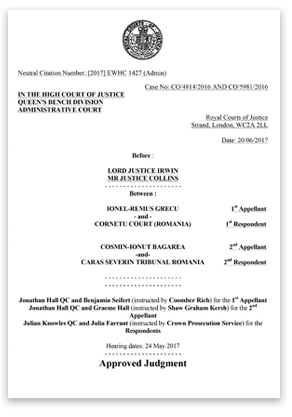 Benjamin Seifert represented the 1st Appellant, led by Jonathan Hall QC. The Court found that, following the judgment of the Grand Chamber of the European Court of Human Rights in the case of Muršić v Croatia, there is a strong presumption of a violation of Article 3 of the European Convention on Human Rights where the personal space available to a detainee falls below 3m² in multi-occupancy accommodation. Such a presumption can only be rebutted when the reductions in the required minimum personal space are accompanied by various cumulative mitigating factors. The background of this decision is that in February 2015 the Romanian Ministry of Justice gave an assurance that individuals extradited from the United Kingdom to Romania would be subject to a minimum of 3m² in closed conditions and 2m² in open or semi-open conditions. This assurance has been given approval by several Divisional Courts but none of them had considered the case of Muršić, decided on 20th October 2016. The Divisional Court in Grecu has decided that the assurance in relation to semi-open conditions cannot comply with the European Convention and that the first mitigating factor, that the reduction in person space would be short, occasional and minor, removed the possibility of compliance with the Convention because the assurance guarantees personal space that is significantly below the minimum. Mr Grecu had been sentenced in Romania to a term of one year and six months for burglary of a door from a house under refurbishment. As his sentence is less than three years, Romanian law stipulates that he would be subject to the semi-open regime and he would therefore only be guaranteed personal space of 2m² during his imprisonment, breaching his Article 3 rights. The Romanian authorities have been given time to consider if they can increase the minimum space for those prisoners who are incarcerated in semi-open conditions. However the current position is now clearly that extradition to Romania for individuals who will go into semi-open conditions would constitute a violation of their Article 3 rights.